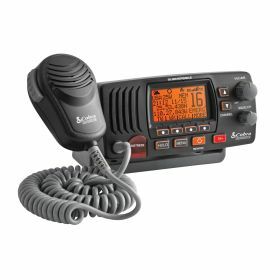 The Cobra MRF57B Class D 25/1 Watt - IPX8/JIS8 Submersible VHF Marine radio features a large illuminated LCD display and Plug N Play External GPS receiver capable (using the optional Cobra C.P.S. CM 300-005), unique Rewind-Say-Again digital voice recorder, automatic radio check function, noise cancelling microphone, illuminated keys, 4 soft keys located at the bottom of the LCD allows user to easily activate and navigate through menus, Distress call button, NMEA in and out, GPS external alarm input, built-in NOAA Weather & Weather Alert provides instant access 24/7 and Emergency Alerts keep boaters informed, Instant channel 16/9, Channel Scan, Memory Scan, Tri-Watch, Signal strength meter, PA & External speaker jacks. Comes with flush and surface mounting hardware, GPS interface cable. In black with a 3 year factory warranty for products sold in the U.S.A.